This week we did a four session (12 hour) charcoal study. That meant we got to use two more tones. Eventually we will be using the whole range but starting out simple is the way to go not only in drawing but in just about every other endeavor. 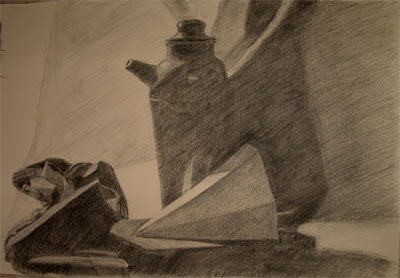 I always think charcoal drawing is like a developing Polaroid picture. You start to see random shapes and shades and then as it develops further, the image begins to resolve. However, you don't just draw one object and then move to another. You have to work the whole picture. It is a constant battle to keep things true and it always amazes me when I have something working nicely and come back only to find that now it is too big/small or off kilter. I would love to have a time lapse video of the whole process. Perhaps one of these days I will have the space and proper tech to do that. Actually, I do have the technology needed just not the space to set it up. A time lapse video would show the cone, for example, morphing from cone shape, to something that looks like it was underwater, to smaller, and finally to bigger. The angles would change, the planes would change. the shape of light would be all over the place. Well, you get the idea. The abstract pile of stuff on the left is actually a wad of fabric. The instructor deliberately left that as an abstract shape. The composition isn't too bad even though it is really for the purpose of the lesson, not to look pretty. We have one more week of this term. Whoo Hoo! Time sure flies. At this rate four years will go by awfully fast. I do have a sense of the hard work that has been put in and hard it has been, for everyone no matter what their skill level coming into the program. Looks beautiful Renee! I would imagine four years of doing and learning about something you love ( with very little latin!) would fly by. But your break will too. How long? 3-4 weeks? It's a good time of year to take a beather.